I came across a list of hot restaurants in St. Louis and noticed that Planter’s House was one of the few that I had not been to so I decided to head to Lafayette Square to check it out. This restaurant, located at the corner of Mississippi Ave. and Choteau, offers both indoor and outdoor seating as well as a large bar. The restaurant has a similar late 1800’s charm to many of the homes in the Lafayette Square neighborhood with old architectural details such as arched doorways and ornate wood carvings. Although it pained me to not sit inside the beautiful restaurant, we chose to eat outside since it was such a nice night. The decently sized patio is nestled between two buildings and has a covered area that is supported by large brick archways. With soft music playing in the background, you almost forget that you are right in the middle of a city. Planter’s House places a large focus on their extensive drink menu, likely due to owner Ted Kilgore’s status as one of St. Louis’ premier mixologists. We were presented with several pages of beer, wine, spirits, and cocktail options. The waiter was extremely knowledgeable about the menu and was able to provide some guidance through the many choices. I chose to have a My Paloma which was a refreshing grapefruit drink. I appreciated that only half the rim was salted so I could choose whether or not I wanted salt. The food menu on the other hand is more limited and I had a fairly easy time making my decisions. 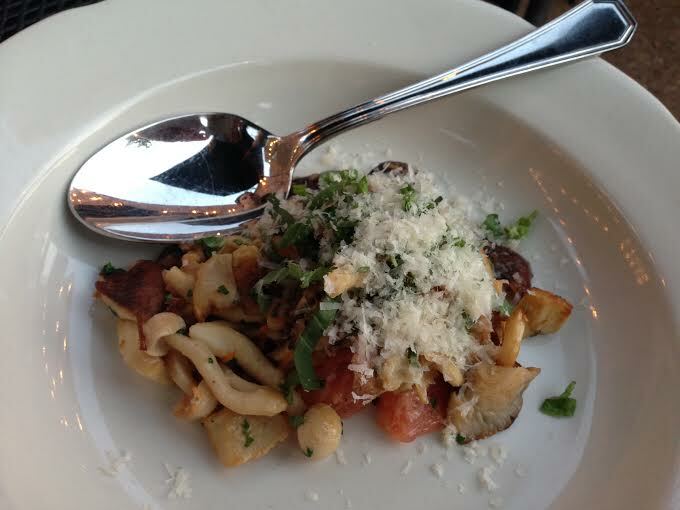 As a starter, my husband and I shared wild mushrooms which were sautéed in pureed lemon zest, basil, grapefruit, and parmesan reggiano. You wouldn’t think that mushrooms, basil, lemon, and grapefruit would be likely friends on a plate but the dish worked perfectly. I would have left completely happy if this had been the only thing I ordered. But then it happened, Olio’s burrata finally met its match. Planter’s House created a mussel dish that would completely satisfy me if it was the last thing I ever ate. The large, perfectly tender mussels were served with a creamy coconut curry sauce that had just a bit of a kick. Cornbread accompanied the dish and was perfect for soaking up the extra sauce and left me feeling more full than I normally would feel after a bowl of mussels. Although I could go on and on, it wouldn’t be fair to the other, almost equally delicious, dishes we had. For my husband’s main course, he chose the duck burger served on a challah bun with remoulade sauce, Irish cheddar, mixed greens, onion jam, and a duck egg. He was surprised how much he loved the duck but said that the burger could have used just a bit less salt. His burger was served with seasoned fries and homemade ketchup. For those of you who don’t know me, I HATE ketchup so much so that I would rather eat mud. However, my husband kept raving about this particular ketchup so after several minutes of convincing I finally dipped a French fry in it and took a chance. I have to say that I was pleasantly surprised and that I may have even had a few more bites. I chose to end my meal with doughnuts for dessert. I was served two, very light doughnuts topped with a lemon sauce and toasted coconut. They were light and fluffy, perfect for sharing, and just the right end to our amazing meal.